Better Block Flyer: Build. Paint. Fabricate. See the Better Block Festival Concept Plan! 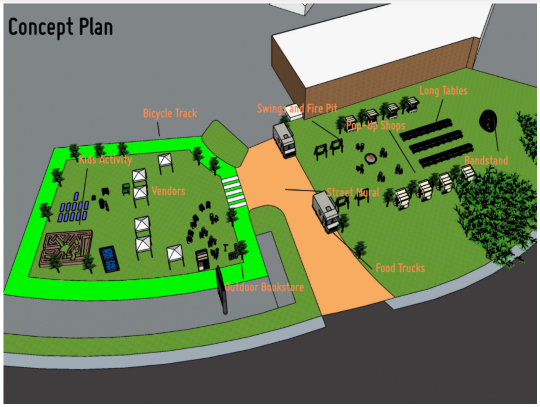 Based on feedback from the community and local business owners, the Better Block Foundation has finalized the concept plan for our placemaking festival. See image below or click here to download the full version. 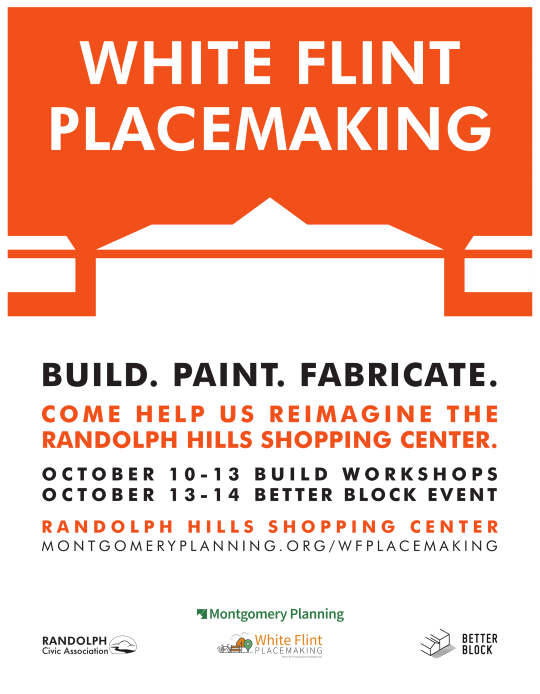 Earlier this year, Better Block and Montgomery County Planning conducted a survey to determine what features and amenities people appreciate most in the Randolph Hills Shopping Center and in our area in general. 100 people participated. See results below or click here to download. 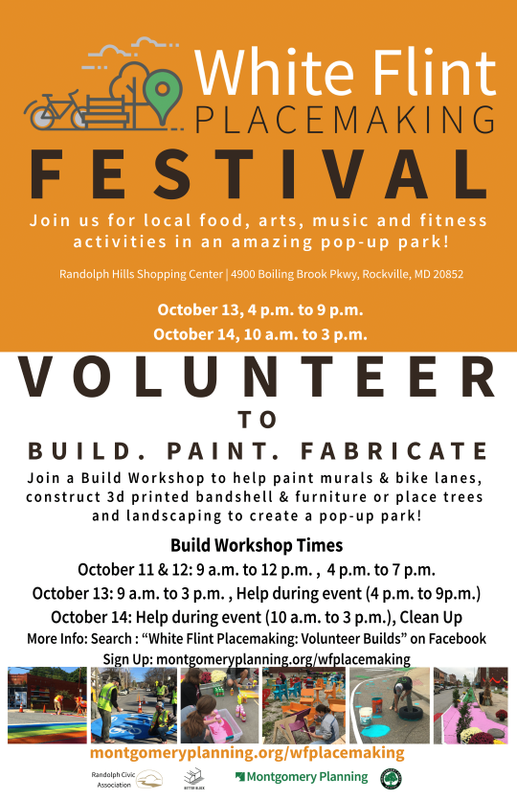 From October 11th through 14th, the Randolph Hills Shopping Center is going to be the site of a “placemaking event” organized by Better Block Foundation, Montgomery County Planning Department, and the Randolph Civic Association. This will be an opportunity to re-imagine what the shopping center could be though community engagement, ideas, and participation. 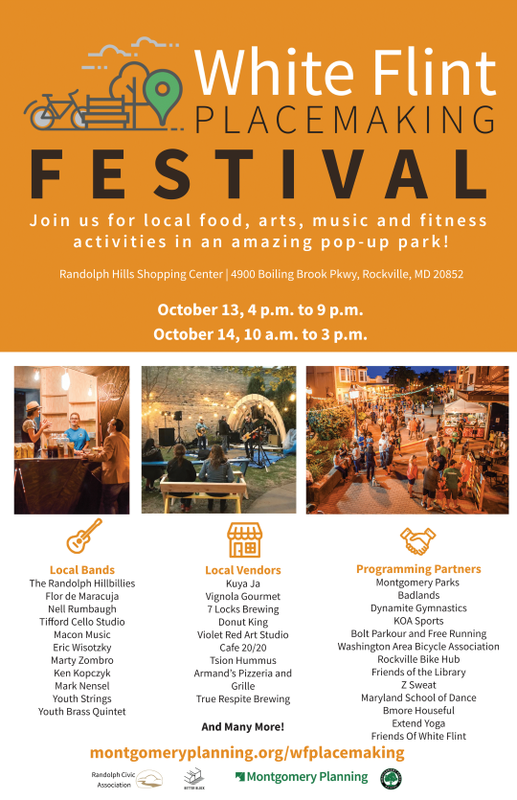 Culminating in a two day festival featuring food vendors, kids activities, and live music, it is sure to be a lively event and an exciting opportunity for RCA-land! If you are interested in volunteering for this effort, SIGN UP HERE. Randolph Hills now has its very own “Morris Column”. It was constructed during the Better Block kickoff event on May 30th. If you have any ideas for the Better Block project or any other community focused information, feel free to post it here! There have been multiple instances of large scale trash dumping at the corner of Boiling Brook Parkway and Ashley Drive. If you happen to witness dumping or suspicious behavior in this area, do not approach the suspects. Please call the Montgomery County Police Non-Emergency line immediately at 301-279-8000 to report it with a description of the suspects and their vehicle if possible. If caught, illegal dumpers are subject to a minimum $500 civil fine and possible criminal prosecution. Our neighborhood stays connected via Nextdoor. Sign up with your home address at Nextdoor.com, and you will be directed to the Randolph Hills group. MC311 Customer Service Center is Montgomery County’s source for non-emergency government information and services. You can reach MC311 by calling 311 in the County or 240-777-0311, 711 for MD Relay TTY, from anywhere, Monday - Friday 7 a.m. – 7 p.m.